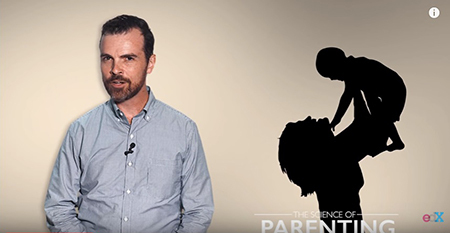 Launched today on the edX platform, the course not only covers scientific findings on a host of hot-button parenting issues but also equips people to tell apart what’s sound science and what’s noise. Barner’s course provides a survey on topics that are central to the lives of parents: diet, sleep, discipline, learning, screen time, impulse control, and vaccination. It also explores ongoing mysteries, like what causes autism, and why so many children are allergic to peanuts. In addition to featuring Barner, who is a leading expert on language and conceptual development, the course includes experts on behavior genetics, lying and spanking, among other topics. Some of the guest instructors include fellow UC San Diego professor Gedeon Deák of the Department of Cognitive Science, Alison Gopnik of UC Berkeley, and Nancy Segal of Cal State Fullerton, who is renowned for her studies of twins. There are also tutorials—on genetics, on how kids can most effectively study for tests, and on understanding and computing correlations. Most of what we know about parenting is based on correlational data, Barner said, because it’s hard to do ethical experiments on spanking, say, or diet. So getting informed about correlations is important. “I want students to be able to dig in and distinguish the claims of authors from what their data can support.” Genetics and heritability are covered because they probably matter a whole lot, too. Barner piloted an in-person version of the class at UC San Diego during a session this summer. It was a flipped class—or one where students get lectures remotely and attend class for interaction with the instructor and fellow students. In the campus course, Barner had students watch the edX videos on their own time. They also read press coverage on various parenting topics, along with articles in scientific journals, answering questions and posting their own. Class time was devoted to discussion and to hosting such guest speakers as LGBTQ parents, midwives, a surrogate, a homeschooling dad, and an autism researcher. Even Barner’s daughter made an appearance. The professor is effusive about his new class and how engaged the students seemed to be. “This was by far the most rewarding teaching experience I've ever had,” he said. The way Barner sees it, most undergraduates in psychology won’t go on to be practicing psychologists or researchers but many will become parents. And even if they don’t become parents, everyone is exposed to spurious science and breathless media coverage—there is value just in learning to be a more knowledgeable consumer. While the campus edition of “The Science of Parenting” won’t be offered again until Spring 2018, the online, edX class is available now. It is suitable for parents, would-be parents and grandparents, as well as professionals in health care, social work and childcare. People who don’t fit any of those categories but are curious learners can sign up too. The edX class can be taken for free. There’s also an option to obtain a certificate for a fee. Barner anticipates that the certificate will be helpful to people hoping to foster or adopt a child, since applications sometimes require showing documentation of relevant experiences, such as parenting classes. The certificate may also be useful to those who are seeking credit for continuing education. The course is self-paced and runs through Dec. 1, 2017. You can enroll at any time. To obtain credit, however, you must enroll by Nov. 1. The time needed to complete the course is estimated at between 15 and 25 hours. If you miss this first session, class will start up again in January. The online course is an initiative under the Center for Digital Learning at UC San Diego, which coordinates campus education efforts in the online arena.The initiative, part of the Teaching + Learning Commons, is closely aligned with the Commons’ goals of supporting both instructors and students. Learn more about other online course offerings from UC San Diego on edX. Learn more about Barner’s Language and Development Lab.